The average American eats about 31 pounds of cheese each year, as indicated in a report published in the February 2005 issue of “Amber Waves” from the USDA’s Economic Research Service. Mozzarella and cheddar cheese are the two most popular cheeses in America. As the incidence of overweight Americans rises, learning whether the cheese you eat contributes to weight problems will help you decide whether to keep eating this relatively high-calorie food. Monitoring your weight and body fat can help you avoid diseases directly associated with being overweight or obese, according to the National Institutes of Health. Eating cheese and other-high calorie, high-fat foods in excess can contribute toward your tendency to gain weight, as well as increasing your cholesterol levels and blood pressure. Hard cheeses such as Parmesan and Romano have about 110 to 120 calories per 1 ounce, while semi-hard cheeses such as cheddar and provolone have between 100 to 120 calories in an ounce. Fontina and Colby, two common semi-soft cheeses also contain about 100 to 110 calories, while cream cheese and feta have slightly fewer calories – about 90 per 1 ounce. Mozzarella cheese has 84 calories per 1 ounce, and gets 56 percent of its calories from fat, about 60 percent of it saturated. Eating 2 ounces of cheese a day adds up to about 10 percent or more of your calorie allotment, if you eat 2,000 calories a day, and 15 percent if you eat 1,500 calories a day. A 3-ounce piece of cheese is about the size of two 9-volt batteries put together. You may find yourself eating substantially more calories from cheese unless you learn to accurately estimate the ounces in your typical cheese serving. 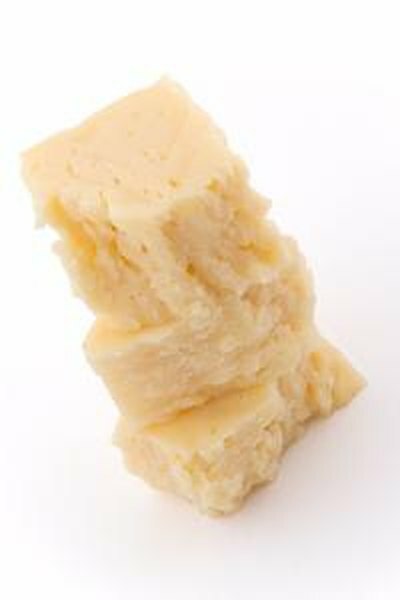 If you enjoy cheese, use it sparingly on tacos, fajitas, crackers, casseroles and chili. Lower fat and fat-free versions of cheese, sold in most grocery stores, offer you the flavor of cheese with fewer calories. A 2-ounce serving of fat-free cream cheese contains 69 fewer calories than regular calorie cream cheese, and a 2-ounce slice of reduced-fat cheddar cheese has 131 fewer calories than the standard version. Other ways to avoid gaining weight while still enjoying cheese are to reduce the amount of cheese you use, measure the cheese before eating and select very flavorful sharp cheeses to get more flavor per bite. How Much Weight Can You Lose Walking in a Month?